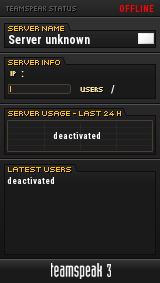 Our Teamspeak 3 server is now online! Through Teamspeak, team members and guests can talk, chat, and text each other; this makes communication much more flexible. Note: The new Teamspeak update as of May 16, 2011 has confused quite a bit of people; In the updated Teamspeak, type in this whole address into the server address textbox. Ignore the password textbox.